Do Mini-Figs Dream Of Plastic Sheep? The current collaboration between the planet’s most profitable and awesome toy company and the America’s longest everything television show seems like a match made in heaven. I hope you all got to watch Sunday’s crossover episode Brick Like Me, and are now poring over it frame-by-frame to catch all 52 in-jokes and bad puns. 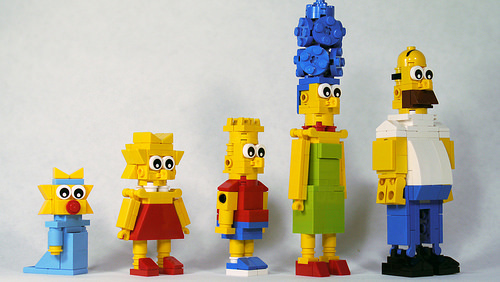 Judging by the activity on Flickr, it looks many of you are now having a ton of fun with your Simpsons LEGO collectible minifigures too. If you haven’t got yours yet …what’s wrong with you?! Make sure to check out the full set on Flickr, including brick-built Homer holding his minifig counterpart. But that’s not all …DOH! David also put together this handy instructional video showing you how to build them yourself. So put those figs aside for a second and give it a go! I must be one of the few then that watched it and thought “meh”. It was interesting to watch, and the character minifigures I think were better than the actual minifigure release. It certainly wasn’t enough to get me watching the Simpsons regularly again though.